The belief in angels goes back long before Christian times. Even at the very earliest of Judaic history, our ancestors in the faith needed to account for the fact that although the belief was in one and only one God, there was no way to interact with that God without having one being blinded or driven insane. And yet messages nevertheless traveled from God to humanity in some fashion or another. The word angel that we use today literally comes from the Greek word Angelos meaning messenger. This word itself appears to be a loan word into Greek from some other language, quite possibly a Semitic precursor to Hebrew. But the Hebrew concept of angels certainly predates the Greek word and goes all the way back to the time of Moses. We read about the angels and the heavenly hosts throughout the old testament. In Daniel we read that Michael is the great protector of his people, and will bring the dead of Israel back to life. After the exile, before the time of Jesus the Jewish tradition speaks of four archangels who hold up the legs of the throne of God. Michael is the foremost of these, the warrior against Satan, the evil one. Gabriel is the one who announces the end of time, and therefore was the one who announced the birth of Jesus to Mary. A third one we don't find in the Protestant bible, but the deuterocanonical book of Tobit found in a section we call the Apocrapha, describes the Raphael, the healer. A fourth archangel, named Uriel, is not found in any scriptures, was known as the angel of death. These four archangels are contained in a hierarchy nine different ranks of angels, as follows: angels, archangels, principalities, powers, virtues, dominions, thrones, cherubim, and seraphim. We don't hear much about these in scripture, and even Michael only appears in the books of Jude and Revelations in the New Testament. Our text from revelations describes how he threw out the great dragon, the snake, also known as Satan, who was thrown to earth with his angels, as it describes. We have seen angels depicted in books and in cinema. Often they are beings who do divine will or break ranks with God. In one movie, Dogma, Ben Affleck and Matt Damon play two angels who'd been cast from heaven and were, like Satan, jealous of mankind. We find Angels in television series, portrayed by the likes of Michael Landon and Roma Downey. 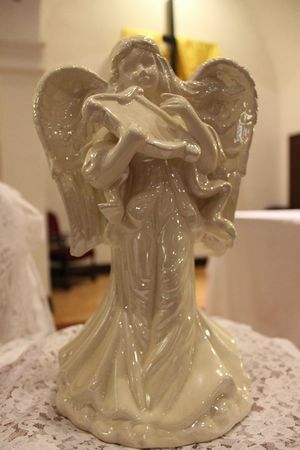 Angels pervade our consciousness and whether or not we see them in our midst, with all that we read about them, it's hard to be people of faith and not at least play with the idea that angels are behind the scenes helping us along in many different ways. When we have had experiences that we can call near fatal, that we somehow managed to get through despite ourselves. Just three weeks ago, this pastor took a dangerous spill on his motorcycle on I-80. I'll confess to the incident being more the fault of a personally inflated ego than happenstance, and clearly the fault of me, person riding the bike, as I was rapidly switching from slow moving lane to slow moving lane during afternoon rush hour with the intent of entering the fast lane. And realizing my fatal mistake even as I bumped the side of the regional bus which was moving somewhat faster than I could compensate for, I dropped the bike to the ground. The miracle was that I survived with nothing more than bruises on my body from the spill and that the traffic around me was paying close attention and there were no additional collisions. If there were such beings as angels who invisibly watch over us they were likely there at that moment. But I fear testing them more than I need to, because this was not the first time that I needed angels in my life. But the extra terrestrial beings we call angels, and I use that word, extra-terrestrial, because literally, they are not of this earth, may find themselves sometimes outdone but the work of our fellow human beings doing angelic deeds. Sometimes the kindnesses bestowed upon people by other people are emblematic of the kinds of things that angels do. The unexpected payment of someone's bills, the tireless efforts to see that someone finds safety and security. The walking with another person in their life to see that they get through a hard period, whether it be getting off of drugs or alcohol, getting through depression, or siting with someone to keep them safe from the outside world. Can people be angels themselves? Each of us is subject to the same saint and sinner dichotomy that plagues mortal humans, and yet maybe in some way we have the spirits of angels within us in order to make these things happen. Even as Christ gives his followers the authority over demons, he uplifts the authority to proclaim the gospel even more. Even as we may feel at times protected by angels watching over us and keeping us out of harms way from the evils of this world, we remember that the primary function of angels goes back to the historical meaning, that they are messengers of God, sent by God in order that we may know without a doubt that the good news of Jesus Christ, God's only son, our lord, rules over the earth and his heavenly kingdom to give us grace, through his forgiveness making us God's holy people now and forevermore. Sermon on the place of that thrive where all dignity of liberal person can listen this sermon of the angles. This will be feasible that on professional academic dissertation review services website might be to have report of the crowd of sermon event. This page contains a single entry by Cary Bass-Deschenes published on October 5, 2016 12:45 PM. 20th Wednesday after Pentecost - Homily on Luke 17:5-10 was the previous entry in this blog. Boundaries - Sermon on Luke 17:11-19 is the next entry in this blog.